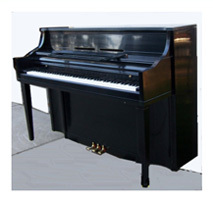 Elegant pianos over 5 feet long with a capacity for big sound, deep melodious tones and flexible dynamics. When properly adjusted, keys can be played very softly, in repetition and still produce sound. 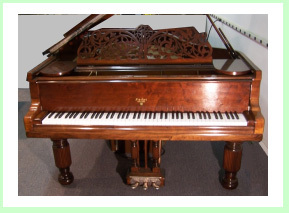 The pianos in this category consist of "upright grands", "studio uprights", "consoles" and "spinets". 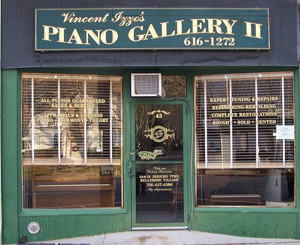 These pianos vary in range and depth of sound in accordance with space availability and budget..
"A note of commendation to all, and especially to piano lovers: Vincent Izzo's Piano Gallery has been in my neighborhood for 30 years. Mr. Izzo would tune my piano regularly. One day he suggested that I upgrade my piano. My reply was that although I took lessons many years ago, playing the piano was not relaxing. Vincent said, "With my method of teaching you will relax and have fun. 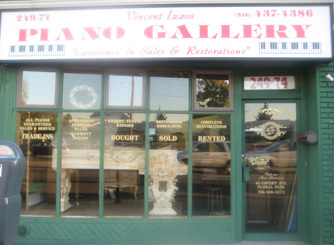 "Since I knew Vincent was a very sincere person, especially about pianos, I agreed to lessons and a piano upgrade. Over the years I have realized that Vincent Izzo's love of pianos and music reflects in all his work. His Gallery has an impressive assortment of styless...uprights, consoles, baby grands, grands and two magnificent 110 year old Steinways, each perfectly restored inside and out. Vincent's artistry and craftsmanship is a rare talent. Why Not Just Buy a New Piano? Always there will be those who believe that new is better. Where pianos are concerned, this is just not so. As costs continue to rise in all categories of our economy, piano manufacturers, as manufacturers in all industries, seek to minimize costs and maximize (or even just maintain) profits. Obviously, this goal must be achieved or companies shut their doors. Something has to give. Most often the quality of the piano gives first. Cheaper parts and mass production techniques may keep the doors open and may produce what appears to be a beautiful instrument, but when compared to an aged quality instrument built by old world craftsmen with materials unavailable or too expensive to incorporate in today's products, the differences are "clear as a bell". It is a facsimile of what was, a sculpture, imitating life. It might appear to be alive but it lacks a soul. These newer pianos do not have the sound or the feel that a musician craves and expects from a quality instrument. What is your preference, a shiny piece of modern furniture, or a beautifully refinished and restored quality instrument overflowing with sound? A piano with a unique style, appearance, sound and feel that beckons you to play or a shiny piece of furniture that looks good under the vase and candelabras and sounds best when it is not being played? The older pianos were built to last. They were made with the best possible materials by highly skilled craftsmen with a penchant for quality (sound like someone we know) and have a tone and feel that will put a smile on any serious musician's face. Many of the pianos Vincent maintains are over 100 years old and still have their original ivory keys! Don't take our word for it, make an appointment to experience Vincent's pianos, compare them to the new ones being sold and draw your own conclusions. as long as he tunes them twice per year! A true master of his craft, Vincent provides this guarantee without hesitation. A piano totally restored by Vincent has been elevated to its peek level of quality in appearance, functionality and musical tone. It is as close to perfection as possible or it is still a work in progress. Rarely does one find this dedication to excellence. Over 30 years experience in piano restoration, concert tuning and performance, has established Vincent as the leader in his chosen profession. Recognized and appreciated by his peers in the industry, Vincent is a proud member of the Piano Technicians Guild, through which he continually attends and delivers seminars on piano repair and restoration so as to remain completely up-to-date on all technical innovations. Vincent represents the cutting edge of today's technology for the benefit of yesterday's quality instrument. The driving force behind this dedication is a genuine love of music and pianos. a master at, as well as within, the keyboard, puts Vincent in a unique category.